I have a few polishes from not just a new-to-me indie, but a brand new indie. Black Dahlia Lacquer formally launched on October 3 and are a mother and daughter team that have released three collections at their launch, with a massive 24 polishes across the line. I have three holo polishes from the Fall 2014 collection to share tonight, and three more glitter shades to show tomorrow. Let's take a look. 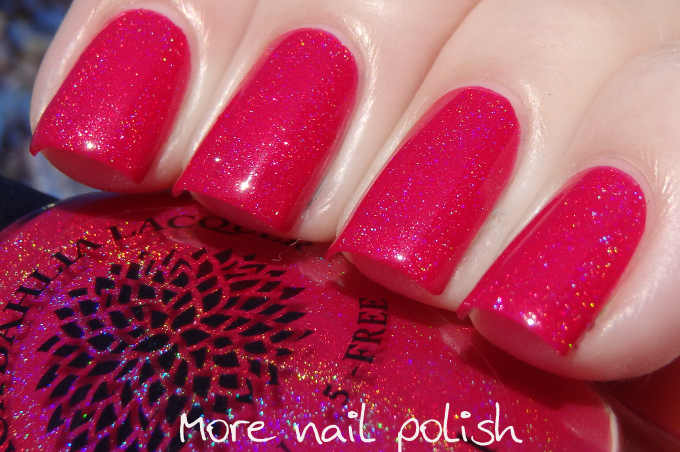 African Violets - a pale lavender shimmer with a soft scattered holo finish. I'm so in love with this shade, it is simply stunning. 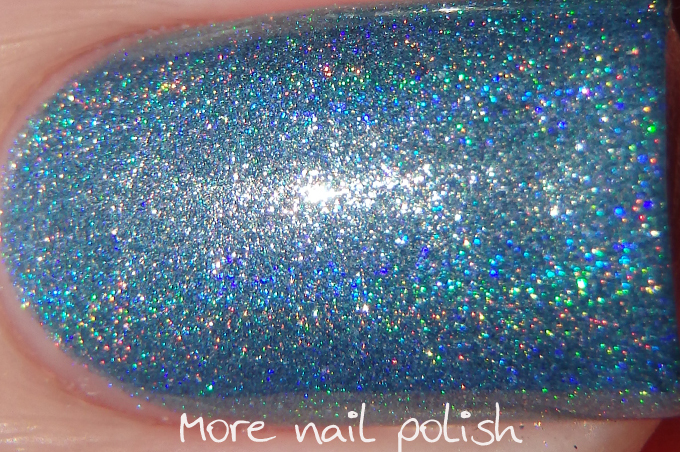 The holo is only subtle because of the milkier finish to the colour, but the pastel blue is gorgeous. Formula was great, this is two coats with Seche Vite top coat. Silver Willow - a much stronger silver blue holo with an added violet shimmer. Clearly the holo is stronger in this one and the added violet shimmer gives this a little something extra. This is two coats with Seche Vite top coat. 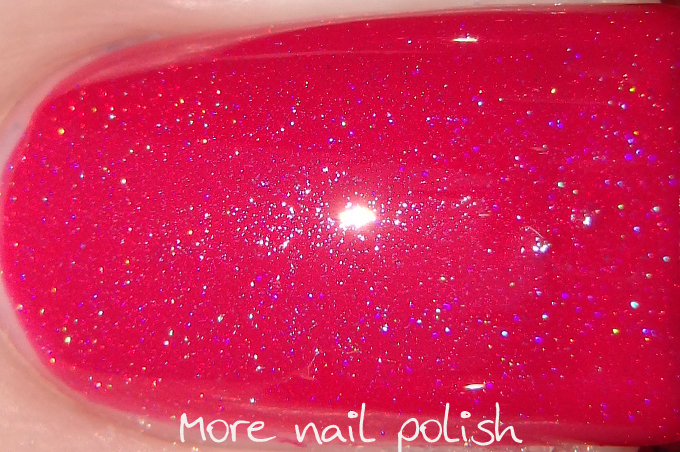 Wild Cherry Blossoms - a richly pigmented red leaning pink holo. This was a killer to photograph. The holo was nearly impossible to capture on the nail in the photos, but as you can see in the bottle it really does sparkle with that bright blue flame. Plenty of pigmentation make this almost a one coater. This is two coats with Seche Vite top coat. These polishes, along with the other 21 shades that form the three launch collections are available from Black Dahlia Lacquer. 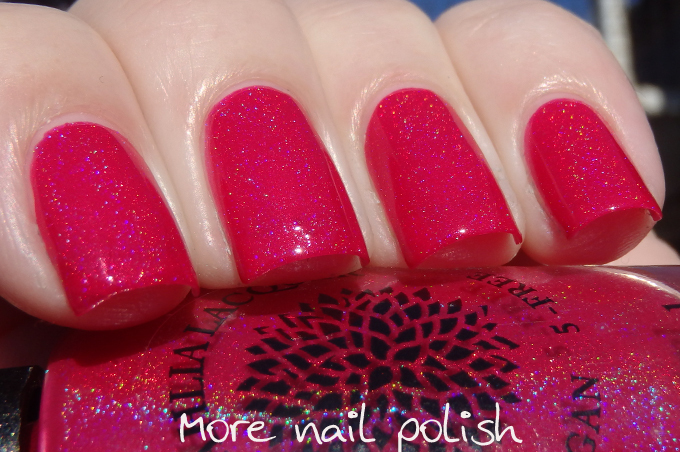 Their polishes are also very competitively priced at just $6 for glitter, cremes and shimmer shades and $6.75 for holos. I love all 3 colors!!!!! They are gorgeous!!! These are gorgeous! I especially like African Violets and Silver Willow.